Please Paul: Why did you give that twenty eight percent raise in pay? Is this the change we waited and waited for so very long? Or are you just a Chrétien clone and always get it wrong? Could we elect a Senate or even a prime minister? Should we have impeachment to improve the way they administer? Was our Charter of Rights written for the United Nations? For everyone in the world in their far distant locations.? Should we have property rights written into our constitution? Or be stuck in your status quo that denies evolution? Will there come a day when we'll be allowed binding referenda? Is proportional representation in your agenda? Should we have recall of politicians who are drunk or brain dead? Are we denied wind turbines for nuclear reactors instead? Will you pay down the national debt -- six hundred billion and climbing? Never mentioned in Liberal papers -- probably the wrong timing. 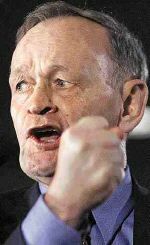 Dear Mr. Chretien: I believe you were not all that happy about having to resign. That fellow Francois Beaudoin that you appointed president of the Business Development Bank of Canada did not seem to realize that he owed you. He should have been more respectful to the prime minister. He wanted a public inquiry. But already this issue has been clouded over in the public mind. You should have appoint one of your socialist friends to conduct an inquiry just to spite him. You have already admitted everything and you did it during an election and Canadians had an opportunity to decide and they still voted for your party. No inquiry could touch you. These inquiries like the Somalia Inquiry or the APEC Inquiry or the Krever Inquiry can take years. An inquiry could be delayed, slowed down, stretched out, cancelled, shut down or ignored as you know. You have the Ethics Commissioner Mr. Wilson and the RCMP Commissioner on your side -- both of whom you appointed to their positions. You only need an invitation to give evidence -- not a subpoena -- and you can be too busy to accept the invitation just like the APEC inquiry. Incidentally Mr. Chretien I didn't vote for you as you know. No Canadian voted for you to be prime minister. Only your sycophant socialist friends in the Liberal Party voted for you to be their leader. Speaking of voters; the next time the separatists vote in a referendum -- either in Quebec or the West -- they will be thinking of you. Don't worry. No one in Quebec at the moment has the guts to pull another referendum. You made sure of that -- $5.5 billion a year in equalization payments, just to keep them quiet. I read about your nephew Raymond Chretien that you appointed ambassador to Washington. He got involved in the American presidential election by saying that Canada preferred Gore instead of George W Bush. That is fairly heavy duty interference in a free presidential election in a foreign democratic country by an appointed ambassador and nephew of yours. Let us hope that Canada does not suffer because of this stupid interference. Why are Canadians denied the checks and balances that Americans have on their politicians? Why are Canadians so politically obedient? Why did Canada fail to qualify for the high level Moodys AAA rating that it held as a steady AAA rating from 1974 to 1994? Why did you break your promise about the GST? 1. Your shenanigans in Shawinigan. 2. The $600-billion national debt. 3. The HRDC giveaways of $billions to friends. 4. The CIDA giveaways of $billions to foreign socialists. 5. A 50-70 cent dollar. At least it's better than a 20-cent dollar. But a long way from a real dollar. You remember when our dollar was worth a dollar. 6. Complete US dollarization of the Canadian economy because no one will trust the ever changing value of the Canadian dollar. I dread to say it but you make Mr. Mulroney (he of the GST) look good. The Loonie (Canadian dollar) has a tendency to jump up and down. This poem was written when it had dropped down near sixty cents. And bankruptcy is bleak before Liberals are put to rout.